Kyushu Diocese is a Companion Diocese of the Episcopal Diocese of Central Philippines (EDCP). How did this come about? At the Lambeth Conference 1998 it was resolved that each diocese of the [Anglican] Communion should, by the time of the next Lambeth Conference (i.e., 2008), have made a serious effort to identify one or more dioceses as a companion, in formal and informal ways. Gabriel Shoji Igarashi became Bishop of Kyushu soon after that, and immediately thought of his friend, Benjamin Botengan, who had already become Bishop of EDCP. 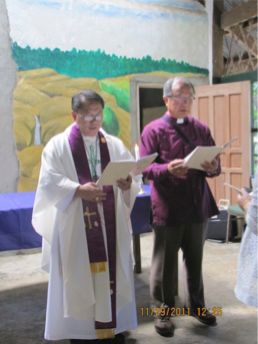 The partnership was quickly established, and continued under Bishop Dixie Taclobao of EDCP when Bishop Botengan retired. 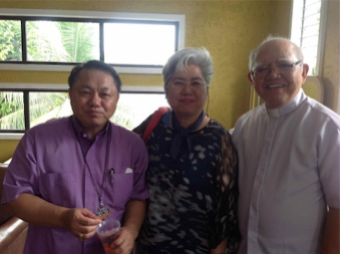 This thriving partnership will be continued under Bishop Igarashi's successor, Bishop Luke Kenichi Muto, who can be seen in many of the photos on the 2013 Work Camp Photos page. The EDCP Convention theme this year (2013) is "YOU are God's Gift; Share your life". We are thankful to our Philippine friends for sharing their lives with us.